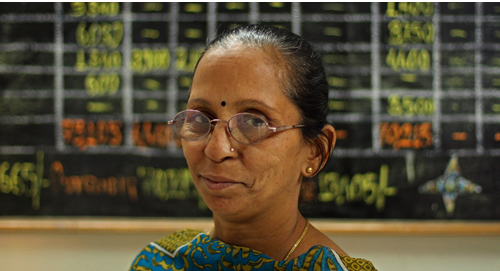 Prema Salgaonkar has been working with Mahila Milan for over 20 years and now heads a group of local facilitators of a daily savings scheme for Dharavi residents. 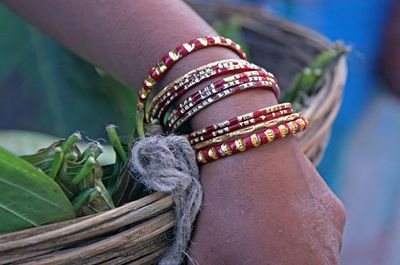 Mahila Milan means “women together” and provides a decentralised vehicle for the empowerment of women via leadership roles and advocacy alongside its pivotal daily savings collection. 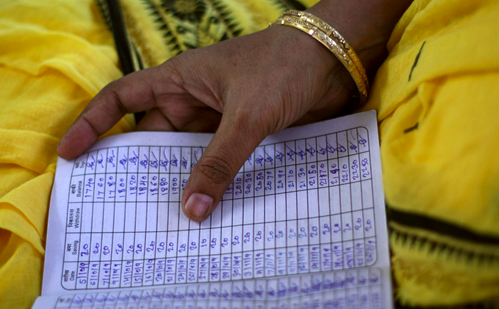 Prema visits around 450 households each day, of which a third will deposit anything between Rs 5 to 200, with almost all households banking something each week. Such a savings mechanism is ideally suited to the irregular nature of earnings at the base of the pyramid which we have been widely discussing here. The deposits from a number of collectives are formally banked but rather than paying interest Mahila Milan provides community and emergency support in a transparent manner. For many, without this daily visit which both incentivises and protects savings, surplus cash would not even be conceived of – let alone put aside. Savings are readily accessible and members of the scheme can apply for credit if required. If loans are requested the local Mahila Milan leaders will assess the need and ability to repay, possibly consulting with neighbours as to the borrower’s situation. Repayment terms are negotiated on a case-by-case basis around the borrower’s earning patterns, with consideration given to the maintenance of some savings alongside repayments. Loans – usually for up to Rs 500 at 2% interest – have helped with school fees, medical bills and entrepreneurial start-ups from tailoring services to coconut vending. The system is not just about collecting money but also about daily contact which deepens the understanding of various issues facing Dharavi residents. Contributing to a consensus of community priorities, this information is often passed on to other support groups in the area such as the local community council (panchayat) plus used to inform a number of Mahila Milan initiatives. One of our informants (above) who used the scheme conveyed that even on the days when she has nothing to deposit that its was reassuring to be visited by a trusted outsider with sound financial knowledge and that she sometimes used the opportunity to discuss issues such as how rising food prices were affecting those beyond her own neighbourhood. She notes that watching her savings grow has allowed her to start imagining and planning a better future for her family – with her mother and sister also active members in the scheme. We were told of numerous success stories like the woman who saved towards buying a second-hand sewing machine which allowed her daughter to leave a gruelling job at a local garment factory to start her own now-flourishing dressmaking business. Another woman with six children and an alcoholic husband saved Rs 5-10 a day till she had Rs 5000 with which she bought a machine to process heavy duty plastic for recycling and now boasts a much higher standard of living for herself and her family. Others access their savings on a more short term basis to counter income fluctuations – still signalling a heightened life standard. And significantly most continue with their savings schemes while servicing their loans. Sudha makes and sells floral garlands at Dharavi and as our conversation turned to savings she told me that she used bishi. 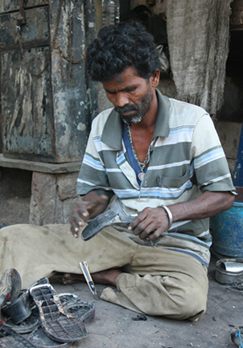 I’ve spoken to a number of people at Dharavi who participate in bishi schemes (bishi = money matters in Marathi). 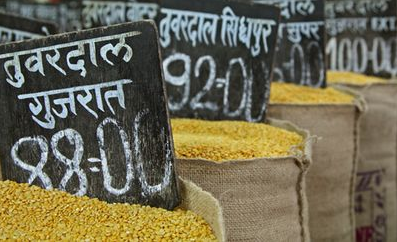 Bishi is a kind of informal and voluntary local savings club which has a long history in India and has been employed rurally to also save and credit rice and grains. Bishi schemes constitute a type of Rotating Savings and Credit Association (ROSCA) – which are found across the world in base of the pyramid communities under a number of various names. The schemes have various forms but at Dharavi basically go something like this example: a voluntary group is formed of 12 women within a particular community nominate an amount that they will each put into the scheme each month. (eg. Rs. 500) providing a monthly total of Rs 6000. Every month they will draw a saver’s name on a lottery system to be awarded the collective Rs 6000. Then that person will be removed from the list so that they cannot claim the full amount twice within a 12 month cycle. On occasion one of the participants may require credit from the group rather than waiting for their name to be drawn (eg. their cooker broke and they need to purchase a new one) They can appeal to the group and together they decide whether to award the full amount to them that month instead of using the lottery system. Some mentioned that even children run small bishi schemes, putting in Rs 2 each a day amongst 30 kids and drawing on a lottery system weekly to win Rs 420 – providing them more motivation to save than merely putting aside money alone which creates too much temptation to spend. Such incentivising to save is mentioned by all women I spoke to though others mentioned that the tendency to spend immediately on winning doesn’t support planned investment. Some told me it was an effective way of drawing some money away from male control of household finances. The widespread and trusted nature of bishi schemes have indeed evolved into a number of more complex community run micro-finance models, some of which even intersect with more formalised banking. Merits and demerits aside – bishi highlights the social aspect common to many savings and credit schemes at the base of the pyramid. Ahead of my research in ernest of unpredictable incomes at Dharavi in Mumbai this month, I am taking this week to explore and photograph the area. 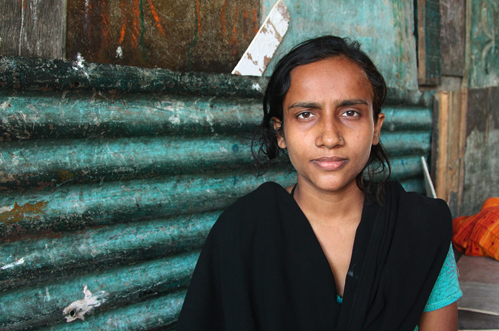 I’ll be uploading images in upcoming weeks to my Dharavi Flickr set. And in the spirit of appreciating those on limited incomes I have opted to take the train to and from the research site. Having visited Mumbai since childhood I have had the privledge of chauffer driven transport in the city or have opted to take taxis. The train from Grant Rd. 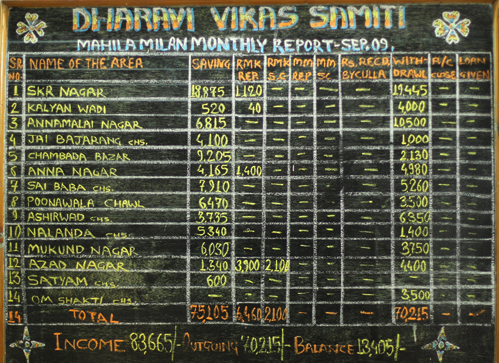 to Dharavi costs Rs 8 return versus about Rs 300 by taxi. But I’m beginning to appreciate that this also provides a quanitifiable travel time rather than the unpredicatble traffic jams one gets stuck in by car – an important factor if you need to arrive at your destination in a timely manner. Plus for an extra Rs 1 I can indulge in having my fortune told and weight measured by the ubiquitous slot machines at Indian railway stations! 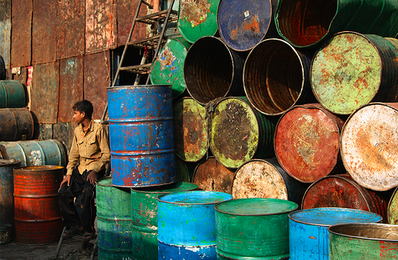 Image: Dharavi youth with 44 gallon drums which are recycled locally for national and global corporates.